Richard Swain launches Reclaim Kosci at the NSW Parliament House. Scientists and leading environmental organisations will today launch Reclaim Kosci, a campaign to overturn the NSW Government’s decision to protect destructive feral horses in Kosciuszko National Park. The Kosciuszko Wild Horse Heritage Act, commonly referred to as the ‘Brumby Act’, prioritises introduced horses over native species and overrides the National Parks and Wildlife Act 1974. 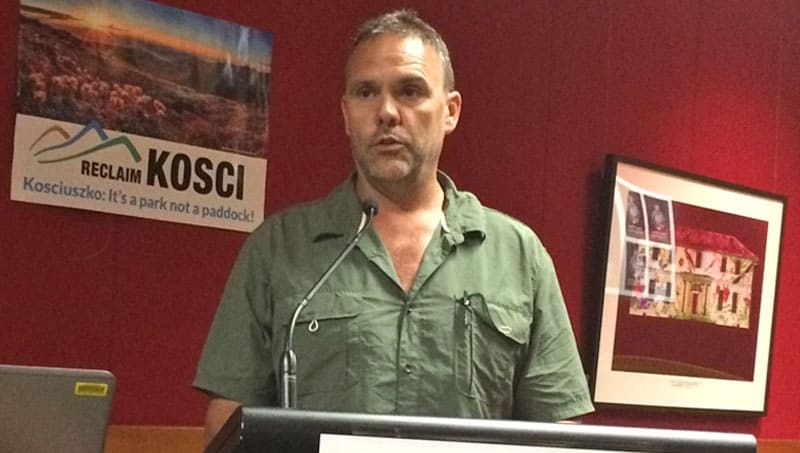 “The ‘Brumby Act’ is an abhorrent law threatening the core conservation values of Kosciuszko National Park,” Reclaim Kosci campaign coordinator Richard Swain said today. Associate Professor Jamie Pittock from the Australian National University says even small numbers of horses harm alpine ecosystems. “The Deputy Premier says feral horse numbers should be reduced to sustainable levels. The science is in: that level is zero. Even a small number of horses trash alpine ecosystems,” he said. “Feral horses are degrading the headwaters of the rivers that provide water to three million Australians. Alpine waterways are being turned into mud baths. “Modelling shows that feral horse populations cannot be stabilised, let alone reduced, by the small number rounded up each year. “Feral horses are driving threatened species, like corroboree frogs, to extinction. Andrew Cox, CEO at the Invasive Species Council, said the community is outraged at the thought of protecting a feral animal in a much loved national park. Alix Goodwin, CEO at the National Parks Association of NSW, is calling on the state government to repeal its feral horse decision immediately. “Why is it being left to the community to fight for Kosciuszko National Park? The damage being wreaked on Kosciuszko by feral horses is obvious to even the most untrained eye,” she said today. Nature Conservation Council CEO Kate Smolski warned that protecting a feral animal that is destroying an internationally significant national park is a grotesque misuse of environmental law. “Feral horses in Kosciuszko are endangering more than 23 native species, including the iconic alpine daisy and two species of corroboree frog,” she said. Speakers at today’s launch will include Associate Professor Jamie Pittock from ANU, Deputy Leader of the NSW Labor Party Penny Sharpe, NSW Greens MLC Cate Faehrmann, CEO of the Nature Conservation Council of NSW Kate Smolski. and Kerry Pfeiffer representing the Monaro Acclimatisation Society. On Thursday, feral horse protesters will converge on Deputy Premier John Barilaro’s office in Queanbeyan in response to the legislation. They will call on him and his government to repeal the Kosciuszko Wild Horse Heritage Act 2018and protect Kosciuszko National Park from destructive feral horses. They will be joined by the Save Kosci walkers, who are marching all the way from Sydney to Mt Kosciuszko in protest of the Act. In June 2018 the NSW Government turned Australia into a global laughing stock when it passed legislation protecting destructive feral horses in Kosciuszko National Park, locking in ongoing degradation of sensitive alpine habitats, fragile waterways and threatening native plants and animals. Overturning the Kosciuszko Wild Horse Heritage Act – which should be called the Kosciuszko Destruction Act – is essential for protecting our fragile alpine region. Reclaim Kosci is led by the Invasive Species Council and supported by the National Parks Association of the ACT, National Parks Association of NSW, Colong Foundation for Wilderness and the Nature Conservation Council of NSW. Authorised by Andrew Cox, 88b Station St, Fairfield VIC 3078.